Explore our full line of Electronics, Computer & Photo and find the product that is right for your requirements. 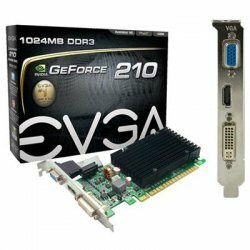 Easy set-up and very easy to use, even for novices, the EVGA 01G-P3-1313-KR GeForce 210 Graphic Card - 520 MHz Core - 1 GB DDR3 SDRAM - PCI Express 2.0 x16 - 1200 MHz Memory Clock - 64 bit Bus Width - 2560 x 1600 - 1 x HDMI - 1 x VGA - 1 x Total Number of DVI - Dual Link DVI Supported could be your best choice. Consider this item, it has everything that you have been looking for in a EVGA. This is a product that will work with you. Goods that are easy to use, and follow your intuition - Electronics, Computer & Photo section, that offers: PNY Technologies - VCGGTX9602XPB - PNY GeForce GTX 960 Graphic Card - 1.13 GHz Core - 1.18 GHz Boost Clock - 2 GB GDDR5 - PCI Express 3.0 x16 - Dual Slot Space Required - 128 bit Bus Width - 4096 x 2160 - SLI - G-sync - Fan Cooler - DirectX 12, OpenG, or Gigabyte Technology - GV-N980WF3OC-4GD - Gigabyte Ultra Durable VGA GV-N980WF3OC-4GD GeForce GTX 980 Graphic Card - 1.18 GHz Core - 1.28 GHz Boost Clock - 4 GB GDDR5 - PCI Express 3.0 - Dual Slot Space Required - 256 bit Bus Width - 4096 x 2160 - Fan and EVGA - 04G-P4-3975-KR - EVGA GeForce GTX 970 Graphic Card - 1.19 GHz Core - 1.34 GHz Boost Clock - 4 GB GDDR5 - PCI Express 3.0 x16 - Dual Slot Space Required - 7010 MHz Memory Clock - 256 bit Bus Width - 4096 x 2160 - SLI - G-sync - DirectX 12, Open. This is a place where minimal investments can make you amazed, we are proud to make a difference. We offer selection of items, that are ready to be delivered to your doorstep. The products that you want are great and available for a lower price, so save money and enjoy shopping at Neobits. For your convenience - we have everything organized. Find a huge variety of similar fantastic products bellow. If you have any questions, don't hesitate to contact our Customer Service department, after all, they are here for you. For a large variety and more related items, please visit other sub-categories for anything you need.